Scooper - Education News: Stay away from these floating terrors ! Stay away from these floating terrors ! 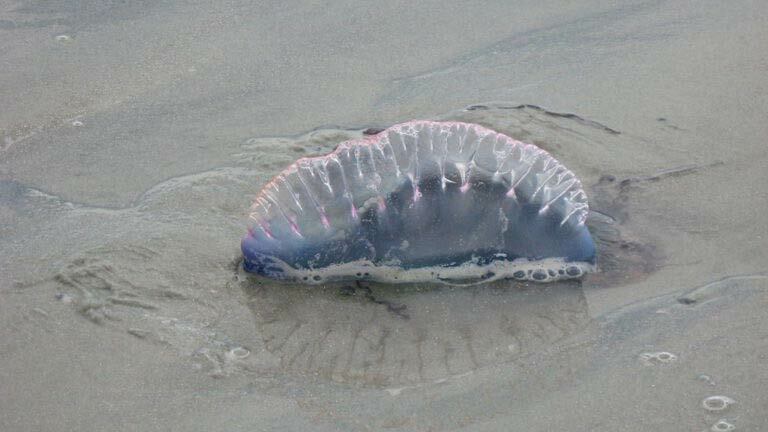 The Portuguese man o’ war, also known as the floating terror or blue bottle, is most often found in the Atlantic Ocean, but also in the Indian and Pacific Oceans. Man o’ war have a sort of supernatural appearance and can range in color from deep blue to clear or violet purple. 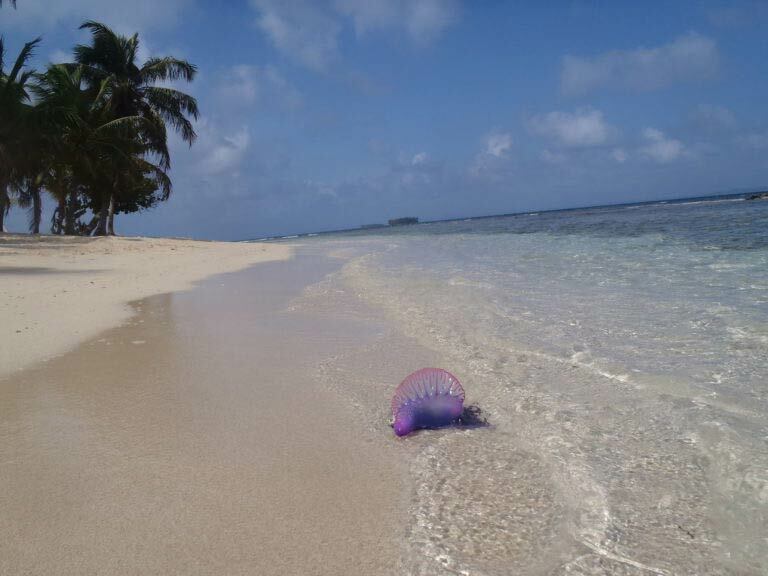 It is possible to be stung by a man o’ war simply by brushing up against one while you are swimming. Be careful where you walk! And definitely, do not touch or try to move the man o’ war. 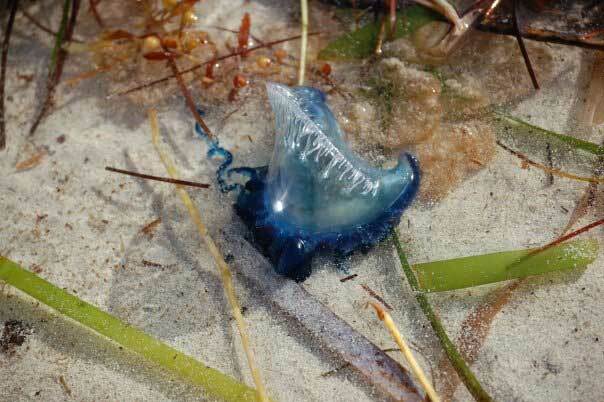 Man o’ war are highly venomous! A sting by a man o’ war can be severely painful, and usually, causes a red swelling that rises well for two or three days. In some cases, the venom may travel to the lymph node and cause an allergic reaction. A sting can incite fever, cardiac distress, shock and in rare cases, death. Where there is one man o’ war, there are likely many. Finding a man o’ war washed up on the beach can soon lead to temporary or permanent beach closure. By nature, the man o’ war presents several problems to humans. Contrary to popular belief, the man o’ war is actually not a species of jellyfish. The man o’ war is a colonial organism, made up of a group of living, interdependent organisms. Man o’ war are composed of medusoids and polyploids, grouped beneath the pneumatophore, which functions as the “sail”. This is the bottle, which is usually the only part visible and not submerged. Man o’ war live at the surface of the Atlantic Ocean, floating along, seemingly innocuous. Their tendrils, hidden from view, can be up to 50 meters (165 feet) in length. On average, the tendrils are generally are closer to 10 meters (30 feet). Unfortunately, even when dead and detached from the group, individual tendrils and pieces can remain venomous, drifting in the ocean for days or weeks. These can be hard to identify or avoid when you are swimming. If you are stung by a man o’ war, do not pee on the sting. Use a cold compress and seek medical attention.